What are the differences between sedimentary rocks, igneous rocks and metamorphic rocks? How are they formed and where are they found? To help kids answer these basic questions on the different types of rocks, this geography worksheet will come to their rescue! 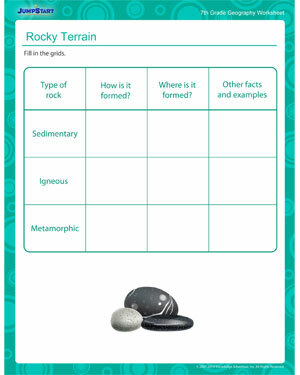 Practice the lesson on rocks with the this worksheet and understand how different types of rocks are formed, which precisely help the rocks to form their unique characteristics. Browse more geography printables for all grades for great practice sessions.